The Serverius DDoS protection protects any IP infrastructure against layer 3 and 4 DDoS attacks. 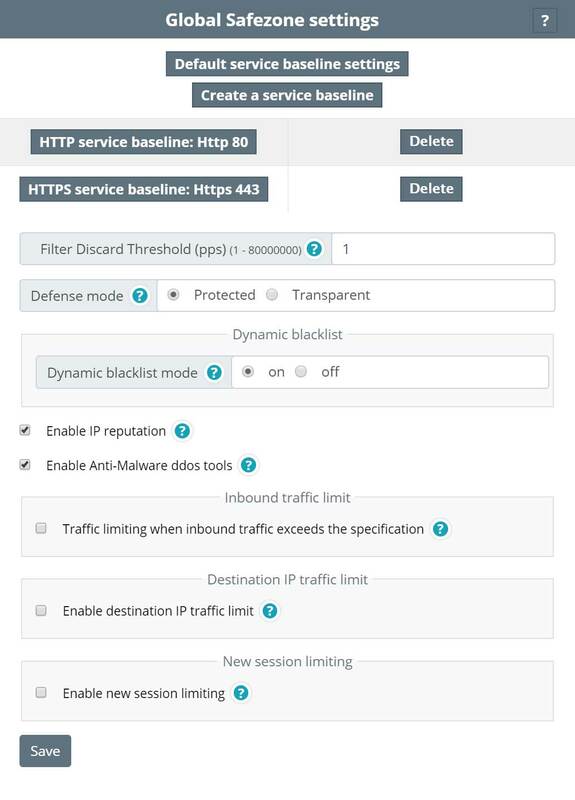 Advanced layer 7 application DDoS protection, BGP features, API functionality and Flowspec. Unmetered DDoS mitigation is offered without IP subnet limits, amount limits, support limits etc. It’s offered for a clear amount per month upfront without any hidden cost afterwards. Defense against HTTP Get Flood, HTTP Post Flood, HTTP Head Flood, HTTP slow header flood, HTTP Slow Post Flood, HTTPS Flood and SSL DoS/DDoS attacks. HTTPS source authentication defense, flood control rate-limits per source IP, use your own SSL certificates, first HTTPS packet checks, sockstress checks, custom build capcha per domain, advanced HTTP(S) layer 7 URL logging, etc. By using the 3TB Serverius network capacity and carrier equipment with our own technology the DDoS protection can handle large volume DDoS attacks of more than 1Tbps. With the form below you can request pricing or the a free trail for a few days. During this test period our engineers will assist with forwarding your data traffic by proxy or configuring BGP, GRE setup, creating your personalized security layer and answer all your specific questions. Testing will be for a period of 2 weeks, on your own risk, during the test period no uptime guarantee will be provided, IP subnets with attack above 10G will be nullled, Serverius support engineers will only provide assistance during Dutch office hours. After the test period I probably want to buy * TIN packageBRONZE packageSILVER packageGOLD packagePLATINUM packageDIAMOND packageI do not know, contact me to discuss. All technical features let users fully configure and control their level of protection by API or controlpanel. Below some examples. 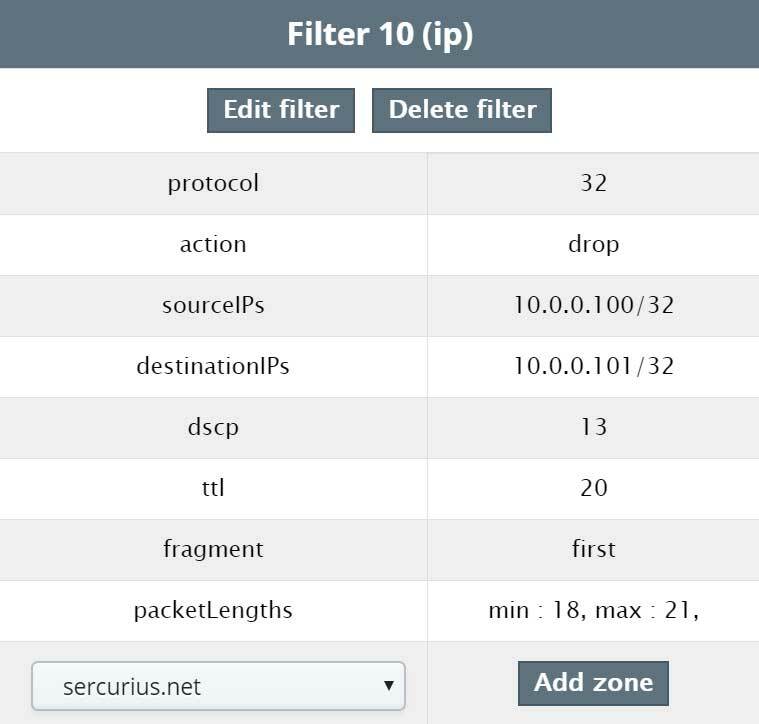 When you are using the Serverius DDoS protection to protect your private IP infrastructure, you can forward all data traffic transparently and enable protection for smaller subnets like a /32 single IP address. It’s even possible to exclude IP subnets from larger subnets. Users can create a personalized protection environment called Safe Zones. Every Safe Zone can hold one or multiple IPv4 (up to a /32 up to a /19) and IPv6 subnets where multiple security feature can be enabled. This way the user can create specific configuration per IP, per software application, per Web Application. The most important layer is the “baseline” protection layer (see image next to this text) where you can set all possible checks for TCP/UDP/ICMP/DNS/SIP/HTTP/HTTPS and other type of data traffic and protocols. To achieve best possible protection level and to avoid any false positive, all configuration thresholds should be periodically tuned to match the safe zone traffic. Therefore the user specific thresholds can automatically be tuned by the “baseline learning mode”. The system will analyze the traffic of the safe zone for a period of time and will adjust the thresholds based on the analytic results. Note: when a defense is enabled the protection system will only collect statistics on the traffic and will activate the defense mechanism only in case the traffic exceeds the threshold. Learning Cycle (Days) : This value indicates the period of time for each learning cycle. The learning result is applied to the defense policy only after such a learning cycle ends. Value Is Larger Than the Current Value the system automatically applies baseline learning results to defense policies once the learning cycle ends if the recommended value is larger than the current value. A location policy can permit, block, or implement traffic limiting for traffic of a country or a region. Many attacks on the Internet are launched by attacks by controlling zombie hosts. These zombie hosts may be centrally located in a specific region. A location policy can block or implement traffic limiting by region, effectively prevents attacks from a specific region. In addition, a location policy can take the pass action on traffic from a trusted region. 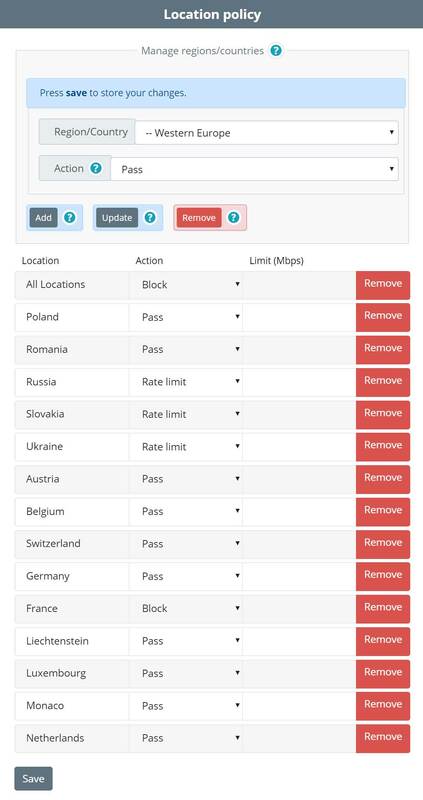 Also, if you want to allow only one or more countries you can block all countries and allow only the countries you prefer. When you are under attack you can capture packets and download them as .pcap files. This will help you to evaluate your attacks and make your protection layer even better. It is useful to be able to capture a sample of an attack traffic. by clicking on the capture button, the system will start packet capturing on 1/1000 ratio. The system captures the packets based on the attack type and the destination IP address. The file will be saved when the system competed 1000 packets capturing or the system considered that the attack has been finished. Tracking of most active 5 million zombies and automatic daily update of the IP reputation database to rapidly block attacks; local access IP reputation learning to create dynamic IP reputation based on local service sessions, rapidly forward service access traffic, and enhance user experience. Filters are like firewall rules, they will allow users to adjust their security layer to their IP subnets. It can block or ratelimit data traffic like firewall rules. As a result it will make a Safe Zones even more personal. Mostly it’s used to block specific types of data traffic and it’s the essential toolset to win the play of cat and mouse attacks. Packets match filters in the list from top to bottom. The matching stops only after the packets match any action defined in the filter. 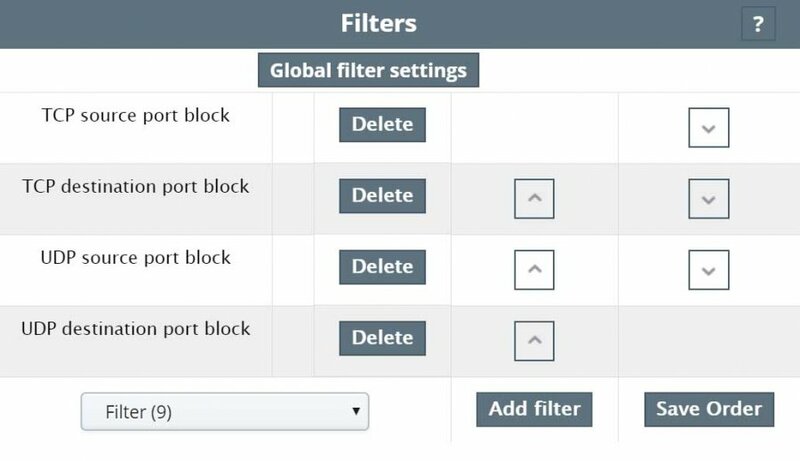 So for example, when a packet is sent from a IP of a source IP whitelist filter, the packets will be allowed and all filters below will not be applied anymore.